A desert endurance race in an old Bug? Sign us up. Believe it or not, but the Volkswagen Beetle has achieved more Baja 1000 victories than any other vehicle in the grueling desert race’s history. That’s extremely impressive for a little rear-engined two-door whose origins date back to the 1930s. 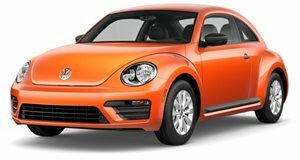 And because of its long association with Baja, Volkswagen will be sponsoring yet another Beetle for this year’s race, taking place later this month. Coincidentally, it’s also the 50th anniversary of the Baja 1000 race itself. This year’s VW-sponsored Bug is a 1970 model year, although it’s been heavily modified and restored. The work was done by ProjectBaja.com, and it’s powered by a stock VW horizontally-opposed 1.6-liter air-cooled engine, complete with a type-1 transaxle specifically for the rigors of desert driving. And, because why the hell not, this old Bug was given a name: Tope. It also received a heavy-duty rear torsion bar adjuster. The dampers were replaced with external reservoir units and stiffer springs were added. For obvious safety reasons, the stock gas tank was also swapped out, replaced by a 22-gallon safety cell. Perhaps the most noticeable difference are the tires, which are definitely not stock. These big suckers are a set of 15-inch Goodrich All Terrain tires. A roll-cage was also added. The team driving Tope isn’t even from VW, but are led by Denver-based industrial designer Josh McGruckin. The action will be getting underway for this old school Bug in just a couple of weeks.